A long time ago, in a Hollywood far, far away… actually, it was pretty much where it is today. But it was a time when science fiction movies were going through a stint of social consciousness, with Planet of the Apes, Silent Running, Soylent Green, The Omega Man, and 2001: A Space Odyssey. 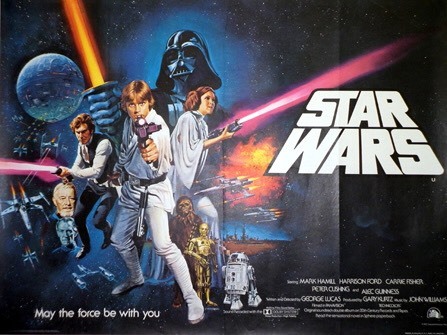 Then came Star Wars, a movie made by writer/director George Lucas because he couldn’t get the rights to Flash Gordon. Everything changed, right? Except a few years before Star Wars, there was another movie that may have jump started the trend back to fun science fiction — or really, science fantasy. 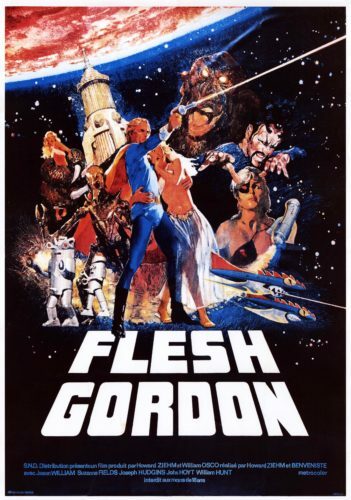 In 1971, some filmmakers wanted to make a parody of Flash Gordon, calling it by the perhaps low-hanging obvious name of Flesh Gordon. But they did it with love, affection, and as it turns out, much better special effects than the original movie serials had. When it was released in 1974, it ultimately made $5 million in 70s box office, and that was for a soft core film which by today’s standards is tamer than most HBO series. Want more connections? Take a look at these two posters — one from 1974 and one from 1977. Sure, they’re both inspired by the same thing, but they look interestingly similar. 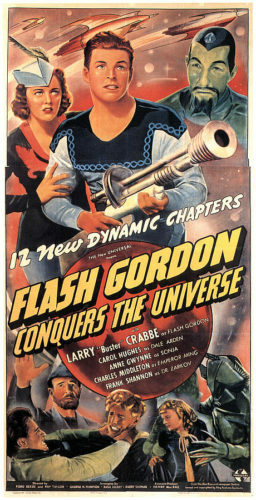 Neither would exist without those movie serials, and those wouldn’t have existed without Alex Raymond’s classic comic strip (which itself was created because the syndicate couldn’t get the rights to Edgar Rice Burroughs’ John Carter of Mars, but that’s another story). Jason Williams, the star of Flesh Gordon, has written his memoirs of his time on the film, and how it took him from being a college athlete to independent filmmaker. Along the way he hung out at the beginning of the Comedy Store, and had the Westwood premiere every actor dreams about having — though it didn’t transfer too well to Hawaii. Jason tapped Fanboy Planet editor Derek McCaw (me) to co-write the book with him, and it will be available in mid-July from McFarland Books. That means it will be available at Comic-Con International in San Diego. You can also pre-order it here through Amazon. It’s a fun read with guest stars including make-up artist Rick Baker, young Pauly Shore, Craig T. Nelson, and even Groucho Marx. As it gets closer to the release date of July 14, we’ll run occasional excerpts. Check it out!